For the last 70 years, billions of marketing dollars have been spent fostering the vision of a perfect lawn that is the envy of the neighborhood. After World War II, chemical companies shifted their focus from war-time chemical production to the promotion of a new range of synthetic chemical lawn care products. Today, every spring unknowing homeowners begin the annual process of applying bags of "4-step" lawn care product or hiring a chemical application company to care for their lawn. This lawn care approach is simple and easy because you just open a bag or write a check, but that's where the big trouble begins. Most people have no idea what is being put on their lawn. In fact, many lawn care companies have no idea what they are putting on their customers' lawns or why – just ask them. They know that product is being applied multiple times a year and that it is presumably safe and effective because it is being applied or sold by a well-known brand or company. But, just because something is sold in a retail store or is heavily marketed, doesn't mean that it's safe! In fact, in the case of lawn care products, they can be down-right harmful to you, your kids, pets, neighborhood and the environment. #1. Synthetic chemical fertilizers put way too much nitrogen in the soil which is a big waste of your money. Only 35% of synthetic lawn fertilizers ever reach the grass roots, the rest leaches through the soil and creates major pollution problems in streams, lakes and drinking water supplies. Of the 35% of the synthetic fertilizer that does reach the grass plants, it is still way too much for the grass to properly use. #2 Chemical fertilization programs: 1) sterilize and disinfect the soil killing most of the beneficial earthworms, microbes, fungi, bacteria and organisms and 2) over-stimulate grass plants with high levels of nitrogen beyond what they can handle which forces lush, rapid growth. This rapid grass growth actually stresses and weakens the grass plants and encourages lawn pests and diseases to set in. Because of the increased pest and disease presence created by the chemical fertilization, chemical lawn care companies routinely apply pest and disease control chemicals which non-selectively kill more of the beneficial microbes, fungi, bacteria living in the soil. With no beneficial organisms left in the soil to support healthy grass growth, this cycle of "high nitrogen fertilizer, forced lush but weakened grass, increased pests, increased diseases, pest chemical application, herbicide and fungicide application" repeats over and over again. This never-ending chemical cycle is why you often see chemically treated lawns look worse and worse as the years go on, the grass plants just cannot handle the onslaught of chemicals. a) In 2013, "The Science of the Total Environment" published the findings of a Purdue University and University of North Carolina study that reported that lawn chemical exposure was widespread in dogs, and concluded that "further study is indicated to assess the risks of herbicide exposure in humans..." and that "dogs may serve as sentinels for potentially harmful environmental exposures in humans". b) The January 2012 issue of Environmental Research reported the findings of a Tufts and UMASS study of over 700 dogs regarding their risk of contracting cancer from application of lawn care pesticides. Their findings concluded that "the use of professionally applied pesticides was associated with a significant 70% higher risk of malignant lymphoma (in dogs)" and because malignant lymphoma in dogs closely resembles non-Hodgkin's lymphoma (in people), the study expressed concerns that "specific chemical components of lawn care products...may potentially contribute to human NHL (non-Hodgkin's lymphoma) as well". c) In 2004 the Journal of the American Veterinary Medicine Association reported the results of a Purdue University study that concluded that exposure to herbicide-treated lawns and gardens increases the risk of bladder cancer by four to seven times in Scottish Terriers. d) Early research by the National Institute of Health in 1991 concluded that there was an increased risk of malignant lymphoma in dogs that were exposed to commonly used lawn herbicides. #5 Lawn care product manufacturers and other professionals have said for years that it's safe for children and pets to go on lawns immediately or "after the product dries" but don't believe it. Many lawn care chemicals are not safe even when they dry. In fact, they can remain active for months and release vapors when walked on or when the grass is cut. Airborne dust from these products can blow around the neighborhood from excess fertilization (think about what you smell when you are in the garden center fertilizer department - it's the airborne product). #6 "Weed and Feed" products are a combination of herbicides and fertilizers which are intended to kill both weeds and fertilize grass in one "easy" application. There are many on the market, but they all contain toxic chemicals that are poisonous to a wide range of living things, including you! In addition to the toxins listed on the label, the "inert" or "inactive" ingredients in the bag can often be worse. 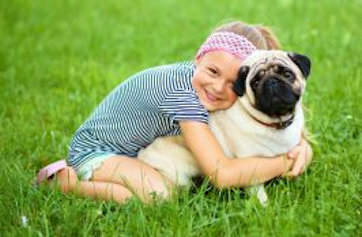 Children and pets that play or crawl on lawns treated with weed and feed products can easily absorb the toxins through their skin or by licking their fingers (or paws). Both pets and people track them into the house. In Canada, all combination weed and feed products have been banned. #7 "Weed and Feed" products apply herbicides and toxins over the entire lawn where it is not needed. The combination of fertilizer and herbicides in one bag puts two incompatible products together. Fertilizer is intended for the entire lawn and herbicides are intended to kill weeds that may only be on 5% of the lawn, but get spread on the entire lawn anyway, spreading completely unnecessary toxic chemicals. The time has come for you to face the facts, stop adding toxic chemicals to the landscape, stop creating health risks to people and animals and make the change to clean, green, 100% natural organic lawn care. The major difference between a natural organic lawn care program and a synthetic chemical lawn care program is the attention paid to the health of the soil. Chemical programs work directly on the grass plants by overdosing them with high levels of nitrogen, basically "hooking them on drugs" and sterilizing the soil. Organic lawn care focuses on building a healthy eco-system in the soil that promotes robust growth of grass plants. When grass gets the proper nutrients in the proper amounts at the proper time, grass plants flourish and naturally crowd out weeds and help keep diseases and pests under control. Organic fertilizers without excessive nitrogen, provide slow release nitrogen that feeds the grass steadily over a longer period of time than synthetic fertilizers, encouraging slow, steady grass growth. This makes a thicker lawn that requires fewer mowings. Organic fertilizers and organic practices build the population of beneficial earthworms, microbes, fungi, bacteria and organisms in the soil which help decompose and recycle organic matter, grass clippings and thatch and turn them into fertilizer the grass can use. The initial step in any organic lawn care program is to get a picture of what is going on in the soil by performing a comprehensive soil test to determine what needs to be done to get your lawn going in the right direction. Some soils are so damaged by prior chemical lawn care programs that improvement in soil health can take an extended period of time which requires patience to see results as the turf recovers from the chemicals. Once soil tests are evaluated, a customized organic lawn care program is developed for your lawn that combines: 1) steps for overall needed improvement in the soil, 2) regular application of the correct type and amount of nutrients to the grass and 3) improved turf management practices. Improved turf management practices include: 1) performing an annual soil test to determine the pH level (grass likes a pH of 6.5-6.8), % organic content, Calcium and Magnesium levels and several other parameters. A word of caution: NEVER put lime on your lawn unless you have done a soil test first to tell you how much and what type of lime is needed. You can do considerable damage if you apply too much lime. If your lawn care provider applies lime without doing a soil test, fire him, 2) cutting your grass between 3½"-4" during the growing season which strengthens the grass and crowds out weeds. Never cut more than 1/3 of the grass blade at any one mowing, 3) cutting with sharp mower blades to make clean cuts and minimize diseases, 4) mulching your grass clippings into the lawn and never rake them up. Leaving mulched grass clippings saves a tremendous amount of additional fertilizer and provides organic matter for the soil. Scientists tell us that for every 1 percent increase in organic matter content, soil can hold 16,500 gallons of plant-available water per acre. Leaving your clippings will help drought-proof your lawn, 5) mulching some of the fallen leaves in the autumn into the lawn which also helps improve the organic content of the soil, 6) core aerating your lawn at least once each year to relieve soil compaction and allow oxygen to get to the root zone of the grass plants. Compaction hinders grass from growing and encourages weeds, 7) slice seeding or over-seeding your lawn each fall to help strengthen the turf and replace the plants that naturally die each year. The science is there, the experience is there, it's now up to you. To view this article in PDF format, click below. Founded in 1997, Sprigs & Twigs, Inc. specializes in organic lawn care and is a national award-winning company in low maintenance, naturalistic landscape designs and installations. They also provide full service tree care, custom stonework and custom carpentry. Sprigs & Twigs is a member of the Northeast Organic Farming Association's (NOFA), the premier organization devoted to training professionals in organic land care practices. Sprigs & Twigs is especially proud that nine of their staff are Accredited Organic Land Care professionals (AOLCPs) who have passed the rigorous NOFA training program. This represents the largest staff of NOFA accredited, trained organic professionals in the country.